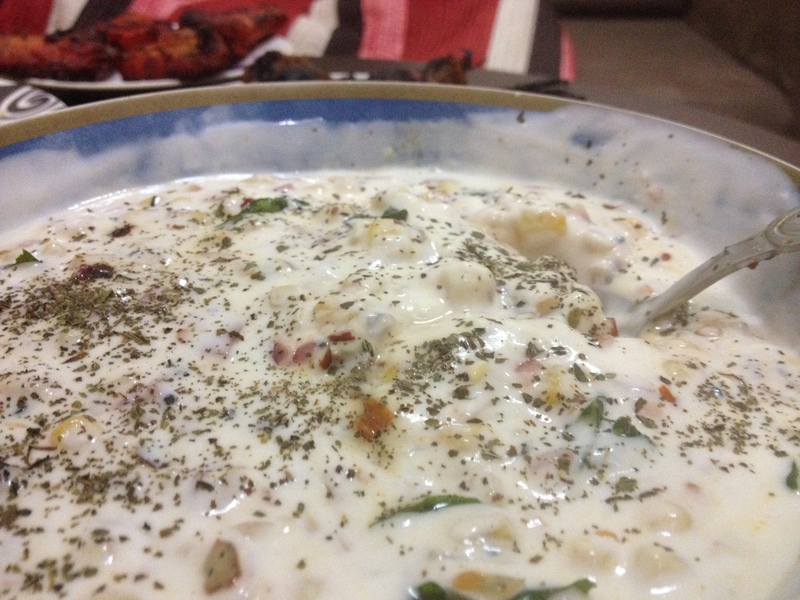 A creamy, sweet and yummy raita… a perfect accompaniment for your pulao’s and Biryani’s. Heat oil in a kadai. Add nigella seeds and when they are warm add the onions, green chillies, curry leaves and sauté well. Add the sweet corn and give it a good stir. Add the sweet corn to the curd and mix well. Top with chat masala and dried mint leaves. 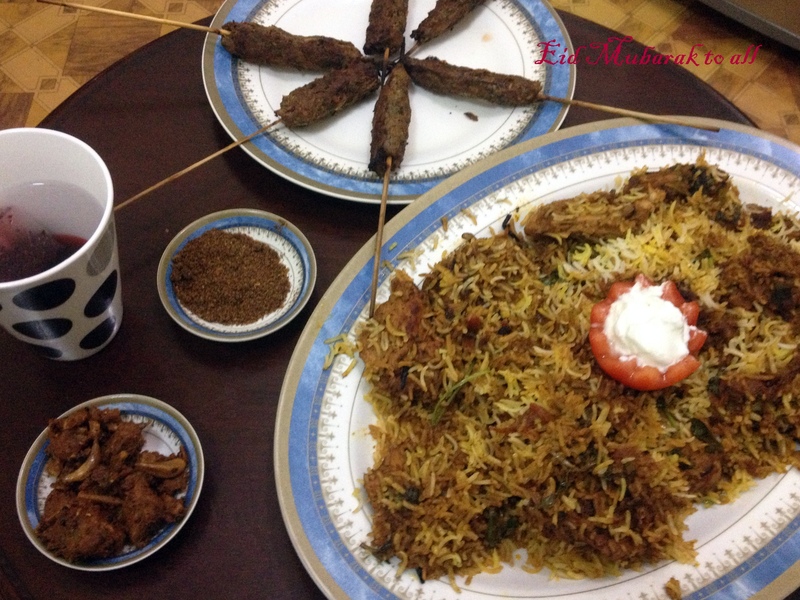 Above: Mutton Biryani, Seekh Kabab, Fish pickle, Kerala chammanthi podi and Raita. Wish all my dear readers a very happy Eid. God Bless. I looooveee Curd. So does my husband so what do you think happens, we make raitas regularly. As a matter of fact it would not be wrong to say we have some raita or the other everyday for lunch. Thats how much we love our raitas. Especially after coming to Qatar, I started buying curd, and now have absolutely thick, smooth, creamy curd, it is absolutely lovely. 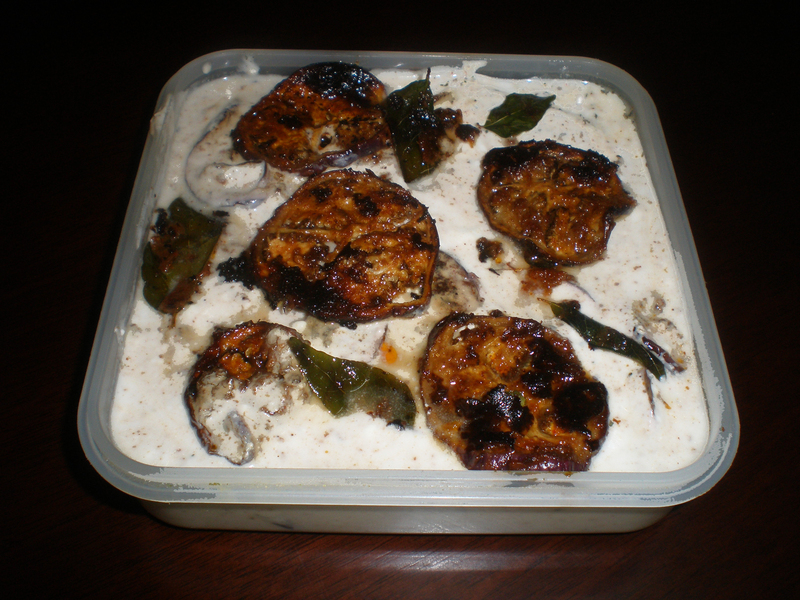 The raita I am going to give you the recipe for today is Brinjal Raita (obviously you know it, you read the title of this post after all). 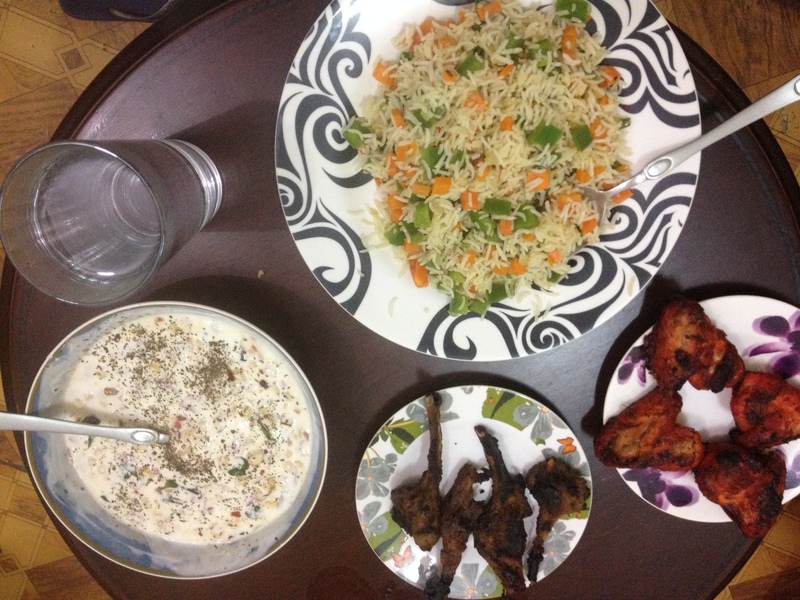 It is not my own recipe but one I got from some source, a source I don’t recollect now :(. No problem I make this raita so regularly that I could tell you the recipe in my sleep. hmm that should be interesting, me waking up from sleep and reciting the recipe. My husband will decide that this time I have seriously flipped. Marinate the brinjals and the curry leaves with the items marked under marinade for a minimum of 10 – 15 minutes. Heat a tava and add the brinjal slices, curry leaves, fry till crisp and brown. Drain on a kitchen towel. Mix the items marked for the raita. The milk is for adjusting the consistency, you may add more or less as per your preference. Store in the refrigirator till ready to serve. Just before serving dunk the brinjal slices to the curd along with the fried curry leaves. If not using curry leaves garnish with mint leaves or coriander leaves. 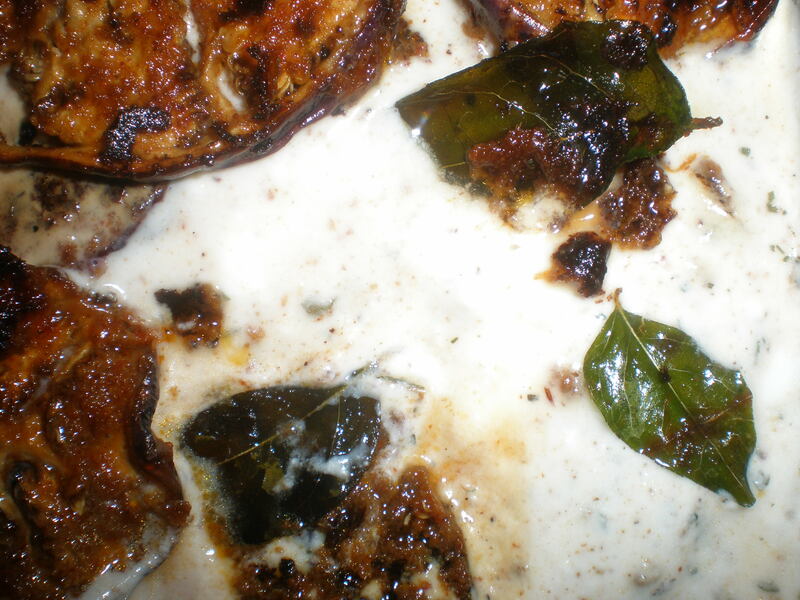 Enjoy tasty, tangy, creamy brinjal raita. P.S The salt level is what it is because of the chaat masala. You may increase or decrease as per your personal choice.